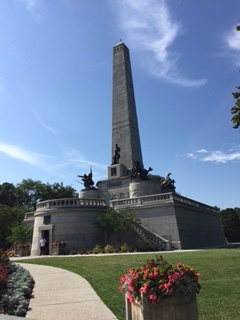 Looking for Lincoln in Springfield, Illinois – Where is Ruthi? Abraham Lincoln is easy to find in Springfield, Illinois. Abe’s face is all over the capital city – on billboards, the sides of buildings, even the water tower. But I want to find the real Abe. The Abe who walked the streets, played with his children, and practiced law. The Abe who discussed politics with his neighbors, laughed with his wife, and waited for the train to whisk him to Washington D.C. to become the president of the United States. The Abe who returned to Springfield to be buried. I found Abe the family man at the Lincoln Home National Historic Site. The historic site is more than simply a house. It encompasses the entire neighborhood where Abraham Lincoln lived with his wife Mary and their three sons. (The Lincoln’s had four boys but Eddie died before Willie and Tad were born). Abraham was well-liked and enjoyed storytelling and shooting the breeze with the neighbors. Abe and Mary were permissive parents and their boys had a wild reputation in their Springfield neighborhood. The Lincoln boys’ rambunctious activities (and Abe’s indulgent attitude) are represented in an exhibit at the Abraham Lincoln Presidential Museum. This is a great place to fully experience Lincoln through many amazing multi-media exhibits as well as artifacts from Lincoln’s life. Two high-quality special effects theaters entertain and educate with sounds, visual wonders, live action, and even ghosts. Walking into a reproduction of the 1860s White House I found Mary Todd Lincoln dressing for a formal event. Giving her some privacy I continue through Lincoln’s presidential years. An eerie, solemn quiet occurs when I encounter Abraham Lincoln’s funeral service. Lincoln can also be found at the Abraham Lincoln Presidential Library. His papers, documents, etc are archived and stored here. However, there is nothing to visit so it’s a quick stop for the Abraham Lincoln National Heritage Area passport cancellation stamp. The Lincoln-Herndon Law Office, where Abe practiced law with his partner William Herndon, is closed for renovations; however, I grabbed up the stamp at the Old State Capitol building. General Ulysses S. Grant greeted me at the Old State Capital State Historic Site when I arrived. I was just in time to hear General Grant relate his experience as a Commanding General of the Union during the Civil War. I sat in the very room, near the very seat where Abraham Lincoln sat as an Illinois state legislator while Grant shared stories about his relationship with President Lincoln. What a treat to meet the General himself! It was at the Old State Capital building where Lincoln delivered his famous “House Divided” speech. Another quick stop at the Springfield Convention & Visitor Bureau for a cancellation stamp on the way to the Lincoln Depot. On February 11, 1861, Abraham Lincoln gave an emotional farewell speech to the city of Springfield before boarding a train bound for Washington D.C. to be inaugurated 16th President of the United States of America. At the Great Western Railroad Depot, now named the Lincoln Depot, President-elect Lincoln delivered, from the back of a train, an impassioned, off-the-cuff, address stating, “I now leave, not knowing when, or whether ever, I may return”. We all know he does return four years later, in 1865. But the return trip is in a casket on a funeral train. Abraham Lincoln is buried in a tomb in Oak Ridge Cemetery along with his wife Mary, who died in 1882, and three of their four sons. Mary Todd Lincoln experienced so much tragedy in her life. Her husband is assassinated at the age of 56, and three of her children do not survive to adulthood. Three-year-old Eddie dies in their Springfield home, twelve-year-old Willie dies in the White House, and Tad dies at the age of eighteen after a trip to Europe with his mom. 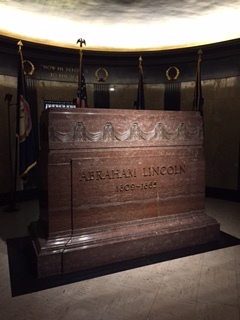 The Lincoln Tomb is a gargantuan place with corridors that lead to the burial chamber of one of the most famous individuals in American history. Abraham Lincoln lived in Springfield, Illinois for almost 25 years. He left footprints all over the city. After collecting eight passport cancellation stamps from seven sites, I feel like I know a little more about the real Lincoln. The Springfield Lincoln was funny, a known prankster, and teller of tall tales. He loved his family and desired to provide for them. The Springfield Lincoln was young and vibrant and passionate. Then he became the president of a torn and divided nation. This entry was posted in Uncategorized and tagged Abraham Lincoln National Heritage Area, Illinois, national heritage area, springfield illinois. Bookmark the permalink. This is the best Lincoln stop. I am not a history person (husband is) and I loved Springfield! !